Premium rod performance even when you travel! Introduction: The GLoomis brand name and high quality are basically synonymous. When Anglers are willing to fork out top dollar for GLoomis rods they expect�.no, demand the highest quality and performance a rod has to offer. In the past traveling Anglers have either had to lug around huge rod cases or make due with lousy extension or poorly made multi piece rods. GLoomis produces the SR-842-3S travel rod for Angler�s who demand the same performance from their travel outfit as they do from their standard gear. Impressions: First things first, this is not a cheap rod. The rod alone is $281. The rod comes neatly wrapped in the traditional felt GLoomis rodsock but also is encased in a durable, and attractive, cordura covered rod case that is light enough to carry on a pack but also durable enough to ship or carry with luggage when traveling. The SR842-3 utilizes the traditional black matte Loomis GL3 graphite blank. 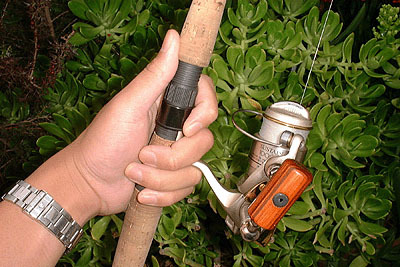 The rod quickly breaks down into 3 pieces and is very lightweight. The 7 foot length does a much better job of protecting light line then the usual 6'6" travel rods. Real World Test: To really put the SR842-3S through the paces it was necessary to test the rod in a real environment. So I packed the rod along with my backpacking gear and set out on a 3 day trip to Glen Aulin area, deep in the Yosemite backcountry. Glen Aulin is a breeding ground for many species of trout, and small to medium brookies are abundant. To minimize weight I carried a very small box of lures which mainly consisted of Blue Fox spinners, Mepps tube jigs, and my favorite�.Acme Kastmasters. While packing for the trip I found the Loomis rod tube a bit too large and cumbersome to strap onto my pack and instead opted to bring the rod in the rodsock alone. The rod fit nicely on the pack in the same area designed to hold tent poles. I felt this was enough protection for the small rod and it minimized the weight. After I trekked out to Waterwheel Falls in the Glen Aulin area I found plenty of deep pools on top of scenic cascading falls. In these pools I could spot trout hovering in pockets, but whenever I got close to the edge they spooked and swam for cover. At seven feet the SR842-3 is a good length for casting over shore brush or from farther back on shore, this allowed me to place the lures in the strike zone without spooking the fish. The rod tip was extremely fast and the top 30% of the rod taper was so quick that it was possible to cast even the smallest 1/12oz Kastmasters a good 20-30ft. The other thing I noticed about the rod was the even taper bend distribution that I was getting on every cast. My experience with lesser travel rods is the sloppy response you get when casting, due to flex inconstancy in the shaft. This was definitely not the case with the SR842-3S, and many times I completely forgot I was using a travel rod. After 3 days of continuous use I was very impressed. On this trip I had landed over 20 good sized trout and the SR842-3S handled each fight with ease, but the sensitivity of the rod enabled me to savor each fight to the fullest. The SR842-3S is definitely designed for Trout. While it doesn't have a huge amount of power in the base does it makes up for this with a very fast and accurate taper. This results in a great experience casting tiny lures. The 7ft SR842-3S is small enough that I had no trouble maneuvering the rod even in hairy situations where I found myself basically hanging off the edge of rocky outcroppings pitching over cascading falls. 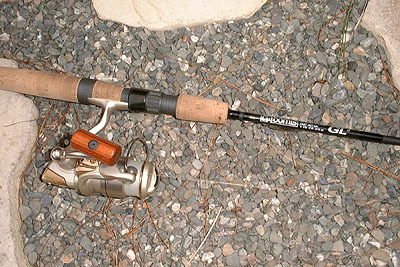 Service: On a subsequent trip I actually used the SR842-3S with light spinning gear to go bass fishing. While using my casting gear I backed my boat into some thick brush and unknowingly caught the tip of the SR842-3S and snapped the top of the rod right off! I called the GLoomis customer service center and they handled my case very quickly. To make a long story short in less then 10 days I had a brand new rod in my hand. In addition when Angler�s cannot wait and absolutely must have a replacement rod in time for the next trip, Loomis also has a $75 dollar instant replacement policy. No questions asked GLoomis will ship same day a replacement rod in a large PVC tube. When you receive the new rod in 24 hours simply put the broken rod into the tube and affix the return labels GLoomis provides. GLoomis is famous for excellent service and support after the sale, and the lifetime warranty that comes with every Loomis is definitely something that adds value to their offering. Conclusion: The SR842-3S is a extremely well built rod...and can be likened to the BMW of travel rods. It handles light tackle and hard hitting backcountry trout with ease and looks simply beautiful on any Angler's rod rack. 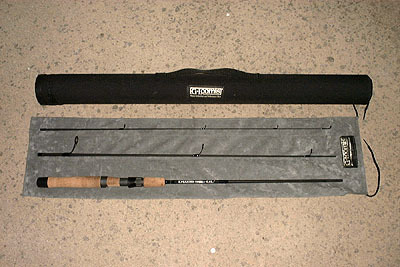 The fact that GLoomis provides both a rodsock and cordura hard case allow Anglers the ability to bring this rod anywhere. Definitely made for Tackle connoisseurs that demand top of the line performance even from their travel tackle, the SR842-3S truly is a worthy premium performer for those willing to pay for it!